BELFAST, Ireland (CelebrityAccess) — British hearthrobs One Direction were forced to cancel their October 20th show in Belfast just before they were set to take the stage after one of the group became ill.
"Unfortunately One Direction have had to cancel tonight's concert in Belfast. Liam has been taken suddenly ill, and the concert will sadly not be taking place. Fans have been asked to hold on to their tickets and there will be a further statement tomorrow. The band apologise to their fans and wish Liam well as soon as possible," a publicist for the band wrote on Twitter. On screen notices at the venue informed fans who were already on hand that the show wouldn't be taking place and indicated that Payne's illness was not serious. 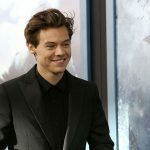 One Direction member Harry Styles took to Twitter to apologize to fans. "Deepest apologies to everyone at the show tonight in Belfast. Very disappointed, but unfortunately these things happen. We're very sorry," Styles tweeted.